The U.N. Convention on the Law of the Sea is as much as anything else about fundamental disagreements between the U.S. and China. The U.S. shouldn’t sign up. UNCLOS enshrined customary maritime law, but it also contradicted it by extending national claims far to sea, well beyond traditional claims, in the form of sui generis Exclusive Economic Zones. By fiat, this creation of EEZs established new claims and conflicts that never before existed. This strikes me not as smart lawyering, but rather as quite a bad idea. Further, China has espoused the doctrine of strict enforcement of its self-perceived UNCLOS rights through military and political intimidation. Moreover, China has, based upon its unitary interpretation of UNCLOS, assumed rights in the EEZs that not only weren’t intended by the framers, but which are troubling in their implications. These rights would extend security as well as economic rights to the limits of the EEZ, and in so doing preclude even routine military surveillance. The widespread recognition of these fabricated rights would be the death knell of freedom of the seas, not its enablement. 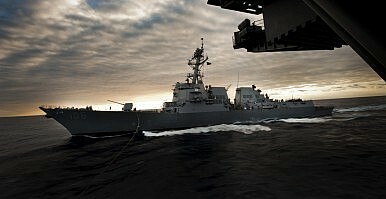 Furthermore, raising the ante of EEZ rights isn’t just problematic, but threatening in the old-fashioned sense – especially because, while the Chinese have prudently toned down their rhetoric in international fora, their aggressive operations in the maritime commons belie any notions that Beijing has moderated its opinions or policies regarding Chinese rights. The particular issue of China within the UNCLOS accession debate has emerged only lately. I would suggest that earlier American endorsements of UNCLOS – every Chief of Naval Operations (CNO), for instance – are obsolete, and have been negated by new circumstances unimagined at the time of the convention’s framing. Standing for the rule of law doesn’t mean signing up for every proposition tabled in debate. Nor does it mean passing every bill proposed in a legislature. That’s the whole point of politics. Besides, this isn’t a rule-of-law issue: this is a contract issue. There are good contracts, and there are bad contracts. UNCLOS is a bad contract, and getting worse because the environment to which it pertains has changed dramatically since it was drafted. Fundamentally, its merits are debatable, and whether or not we sign up to it is an option, and should not be perceived as an obligation. Perhaps one way to express this is to say that what is acceptable with regard to UNCLOS is not new, and what is new isn’t acceptable. Whether or not you think that the contract analogy works, there are good laws and bad laws. Our legal system, domestic as well as international, isn’t meant to be a suicide pact, and there are procedures for demurring and for opting out. UNCLOS becomes a rule-of-law issue when we sign up to it. Besides, we are adhering to UNCLOS. It’s the Chinese that are trying to redefine UNCLOS according to their own purposes, without re-negotiating the contract, and in so doing undermining customary law – the latter being not immutable, but one had better have a darn good reason for changing it. At the tactical level, I don’t believe for a moment that acceding to UNCLOS is going to improve our negotiating position with the Chinese, or change minds in Beijing. The differences at issue are far too substantial for that. Finally, I also don’t for one moment believe that adherents of accession to UNCLOS are prepared for, or even intend to join, the furor that would ensue if joining were followed by a strenuous defense of and insistence upon customary, and never more necessary, rights of free passage. In the final analysis, the UNCLOS issue is as much as anything else, and more than most, the manifestation of the fundamental and systemic disagreement and contest now in place between the United States and China. We need to join that contest at times and places of our own choosing.